Most of us have heard the story of the Three Wise Men at Jesus Christ’s birth and the shepherds from the field visiting and paying homage to Him on His birthday. We also heard about the “three kings” visiting Him on the same day. But the record of the Magi that visited Jesus could be very different then what was most of us were taught. the Messiah from the Stars? Most of us have heard the story of Three Wise Men, Jesus Christ’s birth and the shepherds from the field visiting and paying homage to Him on His birthday. We also heard about the “three kings” visiting Him on the same day. But the record of the Magi that visited Jesus could be very different then what was most of us were taught. The KJV translates the Greek word “magos” from Matthew 2:7 as “Wise Men,” but many other translations, such as the NIV, translate it as “Magi” (our word ‘magic’ comes from this). Magi were priests in a sect of the Persian religions such as Zoroastrianism. They were the Oriental scientist of the day (Strong’s). The magi studied the stars religiously. They would have probably been wealthy and held high esteem in their society, but nowhere does it mention in the Bible that they were kings. Moreover, there is no indication there were only three of them. These Wise Men were diligently looking for a sign in the stars for the coming Messiah (I will publish sometime in 2018 the MessiahScope© which will add more light on this). But where did they get their knowledge to look for a Jewish Messiah? They were not even Jewish. The answer is in the book of Daniel. When Jerusalem was conquered by Nebuchadnezzar, 1/3 of the Jewish people were killed; 1/3 were scattered, and 1/3 were captured. Daniel was one of them that was captured and through a series of amazing events he eventually was chosen to rule over all the wise men in the land (see Daniel 2:48), including the astrologers and magicians (considered scientists of the day). In fact, Daniel was found to be ten times better than all the magicians and astrologers that were in all the King (KJV) Nebuchadnezzar’s realm. Now the Jewish people that were scattered did NOT retain the knowledge of the stars, but Daniel did and he taught the wise men of the day. It is amazing that they retained this knowledge and passed it down to future generations for what some estimate to be over 500 years to Jesus birth! “The Journey of the Magi” (1894) by James Jacques Joseph Tissot (French painter and illustrator, 1836-1902), oil on canvas, Minneapolis Institute of Arts. At least 30 people pictured. which is about 900 miles from Jerusalem. Some theologians estimate the trip was over 1,000 miles. Since traveling was difficult and dangerous (e.g., there were gangs of thieves that preyed on travelers during that time. On Roman record says that one gang of robbers numbered at about 600!) It is highly unlikely only three people traveled this distance alone, especially with those expensive gifts. The tradition of three kings only came from the fact three gifts were given, but it does not mean there were only three people. Most likely it would have been a large caravan of people. They most likely only traveled about 7-15 miles a day. This trip could have taken as long a 5 months! In Matthew 2:2-3, it says that not only was King Herod was troubled when the Magi came to inquire where in Israel the Messiah would be born, but the entire city was also. It concerned Herod since he was King and he knew of the Jewish prophecy that a King of the Jews would be coming. He was concerned about his reign as King. The rest of the city, mostly made up of Jews, were troubled since they did not hear that the Messiah was born and they wanted to get ready to overthrow the Roman rule. It may be that the whole city knew since it was a large group of people were traveling, which would have drawn much attention. How many, we do not know, but it certainly was much larger group than three people. 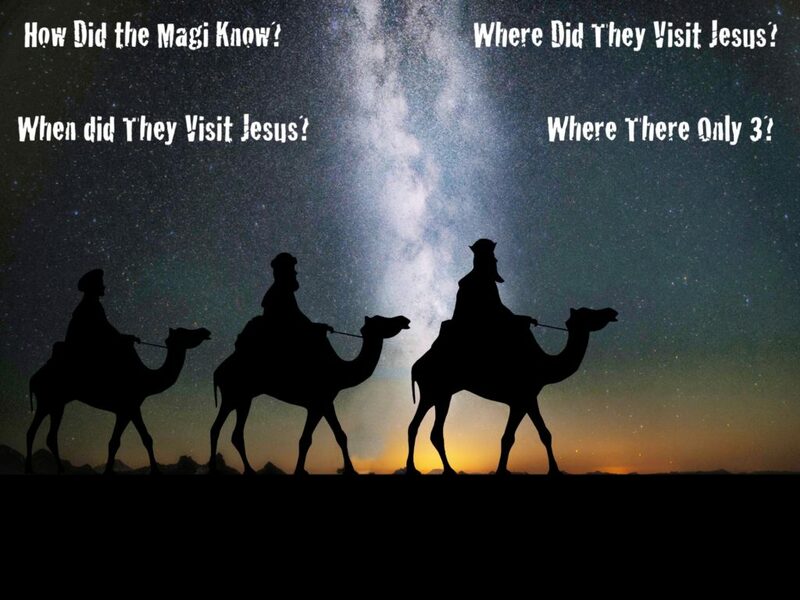 How Old Was Jesus When the Magi Came? Since traveling was so difficult during that time and Joseph and Mary had a new born, it appears they decided to stay in Bethlehem for a while, for roughly 18 months. It mentions the difficulty of traveling with a young baby in the JGV (Jesus Gospel Version) Chapter 18, Luke 21:21-23, Mark 13:14-18, Matthew 24:15-20. But when ye therefore shall see the abomination of desolation, spoken of by Daniel the prophet, standing where it ought not, in the holy place, (let him that readeth understand). Then let them that are in Judaea flee to the mountains; and let them which are in the midst of it depart out; and let not them that are in the countries enter thereinto. “And let him that is on the housetop not go down into the house, neither enter therein, to take any thing out of his house: And neither let him that is in the field turn back again to take his clothes. Herod had all children “Two years old” and under killed in Bethlehem. This is another indication Jesus could have been a toddler (under two years old) by the time the Wise Men visited Him. It should not bother us when we see Christmas decorations with only three Magi worshiping Jesus and giving Him gifts in the manger. The Bible always affords us the opportunity to show others the accuracy of the Word, but this should only be done in humbleness. It is by showing people these simple things, that we may have the opportunity to witness the greater truths of the Bible and win people to Christ.